When it was built in 90AD, while Arles was a thriving Roman city, the awe-inspiring Amphitheatre d'Arles also known as the Arènes d’Arles was a place for entertainment which included chariot races, bloody hand-to-hand battles, gladiator fights and animal hunts which took place here until the end of 5th century. Today, it remains one of the earliest Roman Monuments and spreads across a huge area as proof of the city’s transition from an ancient city to a medieval European one. During the middle ages the arena changed into a fortress. Today, it is a UNESCO World Heritage Site with its alluring structures of Roman charm and an air of archaic beauty beyond compare. The oval amphitheatre has a seating space for 20,000 people and is surrounded by open terraces, acriss-cross of arcades, a system of galleries, corridors – all exhibiting the splendour of earlier times. 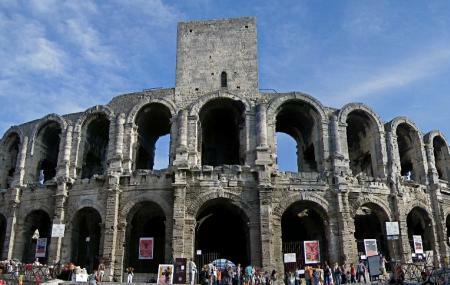 The amphitheatre is bustling with spectators during April and mid-September, when the Feria d’Arles is organised. The famed festival is held every year and is centres around bull activities. The matadors project their skill and valour required to fight a bull and is received by an exuberant crowd. Plays and concerts too are held regularly in the Amphitheatre d'Arles. Ticket prices may exist for individual events. How popular is Amphitheatre D'arles? People normally club together Theatre Antique D'arles and Espace Van Gogh while planning their visit to Amphitheatre D'arles.